Most divers seek out scenic underwater locales such as crystal-clear seas, historic shipwrecks and coral reefs teeming with wildlife. When Ken Fredette goes down, invariably it’s in the last place any recreational diver wants to be: a drainage ditch, a municipal water tank or the silt-filled, low-visibility waters behind hydroelectric dams. 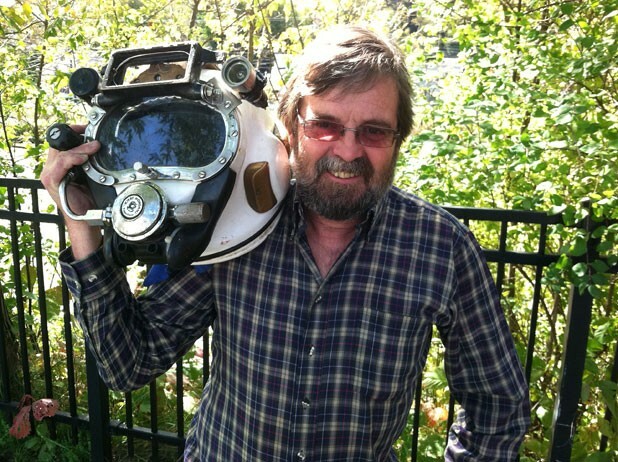 Fredette, 56, is a commercial diver in Wallingford. Rutland County may seem like an unlikely place to earn a living as a diver, but Fredette has carved out a comfortable niche doing underwater construction work for M&K Commercial Diving of North Clarendon. And in Vermont, there’s work to be had. In 2005, after a sewer line ruptured in the Winooski River, Fredette helped fix it. He’s also done underwater welding on the Missisquoi Bay Bridge, repaired the support stanchions of highway overpasses and sealed the intake lines at Burlington’s Moran Plant. However, the bulk of Fredette’s jobs are at hydroelectric dams throughout New England. When logs and other debris pile up behind a dam, Fredette’s company is called to clear it out to prevent damage to the floodgates and turbines. In winter, when the dams are inaccessible, Fredette cleans municipal water tanks. How’d a Vermont farm boy get into this gig? When he was a child, Fredette’s family vacationed at Malletts Bay, where he snorkeled for hours on end. At 20, he got SCUBA certified, then moved to California to learn commercial diving. Later, Fredette spent four years working offshore on oil rigs in the Gulf of Mexico, laying pipeline along the ocean floor, doing inspections and clearing ropes, cables and other debris that fell or got tossed off the drilling platforms. Unlike SCUBA divers, Fredette is always attached to an umbilicus that supplies him with air and warm water to maintain his body temperature. He communicates with those “topside” using a headset and video camera mounted on a 25-pound helmet. Fredette has some unique tools, including an underwater drill, a hydraulic chain saw and a Broco, or underwater cutting torch. “It’s the closest you’ll ever get to having a light saber,” he jokes. Even after many years on the job, Fredette says he hasn’t lost the thrill of being weightless in water. SEVEN DAYS: What’s the most dangerous aspect of your job? KEN FREDETTE: I always joke, it’s getting to the job, driving on the roads! But one thing we deal with a lot at hydroelectric dams is when they have a leak in a gate they’re trying to seal so they can dewater and work on the turbines. If that gate isn’t sealed, there’s water flowing through there that can grab ahold of you or your dive rig. You can find yourself in a bad situation. SD: Ever had any scary experiences underwater? KF: [Company owner Dave Hathaway] is very safety oriented, so I don’t consider my job dangerous. One time I was working near the crest of a dam, and there was lots of rebar around, and the turbine tripped and shut down unexpectedly. So the river started coming up quickly, and they were having difficulty getting me back to shore because my dive rig was snagged on the rebar. I was never really in any danger, but it was a situation I would rather not be in. SD: What’s the most unusual place you’ve worked? KF: There was a municipal water-supply reservoir with a floating tarp on it. A beaver had gotten under there and built a lodge and was living in the drinking water. So we had to go in and dismantle it to get the beaver out. We also do a lot of work down in Lowell and Lawrence, Mass. Sometimes we have to get down into their canal system. There’s lots of history there. SD: Ever work in tight quarters? KF: We had a job in a lake down in Pennsylvania where they had a problem with the drain and were in danger of losing the whole lake. We got inside that pipe and put a plastic liner in it. Working inside the pipe was a bit unusual. I wasn’t very happy about it. I couldn’t even touch my hands together. SD: I take it you don’t suffer from claustrophobia? KF: Actually, I do! But we don’t get ourselves into situations we can’t get out of. SD: What’s the worst part of your job? KF: Wishing I were young again. Sometimes, after working in a public water-supply tank, we’re weighted pretty heavily and wearing dry suits because we can’t contaminate the water. After an hour and a half, you’re pretty tired, and you have to climb the ladder. You can get to the surface of the water and still have another 40 feet to climb, straight up with all this heavy gear. All of a sudden, you feel like you weigh 800 pounds. SD: What’s the best part? KF: I just love my work. I get to relive my childhood. I was doing this in my twenties, and now I’m doing it again in my fifties. I get up in the morning and there’s always something new to do.